When you buy an used car, to some degree you’ll have to rely on the word of the previous owner as to the quality of the vehicle, the amount of maintenance it’s had, and the true value of the car. That’s a scary truth, especially since you’re the guy or gal who’s about to shell out a few thousand dollars. Fortunately, you can try before you buy — be sure to test-drive your prospective vehicle, before you shell out the dough. 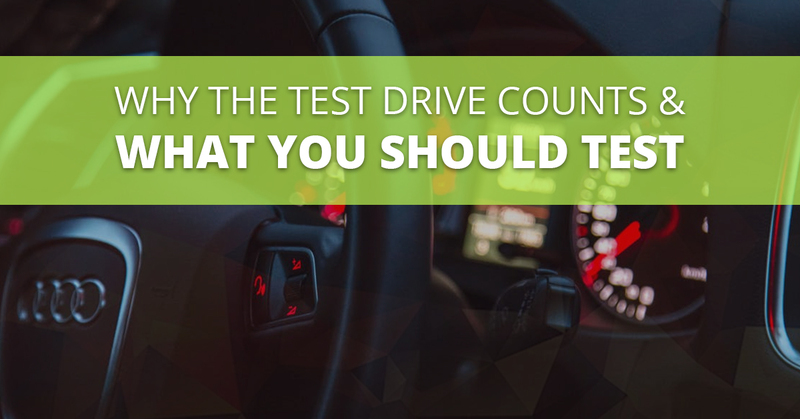 And when you do have an opportunity to test drive the vehicle you’re in which you’re interested, it’s wise to test everything you can while on your test drive. Gas: Don’t be afraid to test the acceleration on your trial run — just be safe while you’re doing it. Make sure that the car can handle a fast acceleration (think about accelerating onto the highway). Also, while the engine is revved, be sure to listen for odd noises, and pay attention to how well the vehicle handles. Brakes: Next up, test out the brakes. Try a fast stop (again, be safe). Listen for grinding noises or a stutter in stopping power (which is an indication that the discs are warped). You may also be able to look at the depth of the car’s brake pads. E-Brake: Put the car on a slight incline, place the gear in neutral, and let the car roll a touch; then pull the e-brake. It should stop the vehicle without a problem. Steering: While remaining safe, try some tighter maneuvers to see how well the vehicle responds to turning at speed. The vehicle should feel responsive, and the tires should hug the road. Cruise Control: Put the vehicle in cruise, and try a mile or two on the highway. Make sure that it sustains speed properly, and the speed can be adjusted with the steering wheel buttons. Other Driving Checks: How’s the transmission running? Is it smooth? Do the wheels on the vehicle vibrate? Does the car pull to the right? Be sure to get up to highway speeds to test the vehicle’s performance. Music, Entertainment, Electronics: Most cars are outfitted with high-tech stereos, GPSs, cameras, and screens these days. Check all of the electronic components throughout the vehicle. Check the Struts/Shocks: The struts and shocks of the car should be responsive. Push on the hood and the trunk of the vehicle. Does it bounce back right away? Is it difficult to move the vehicle with just your weight? If the struts and shocks are shot, the vehicle will sink easily and it won’t bounce back quickly. Look at the Tire Tread: Tires are expensive! Take a look at the tread depth of the tires on the vehicle. If the tires are quite bare, you’ll have to replace your tires before too long. Gauges: Take a keen look at the dashboard as you drive. Are all of the gauges responsive? Does the temperature fluctuate as you drive (it should stay steady after the car is warmed up)? Does the check engine light come on? Be sure to check the mileage on the vehicle while you’re at it. Wipers & Fluid: It doesn’t matter if it’s snowing or not; flip on the windshield wipers, and use a squirt of windshield fluid to ensure that the wipers are working and the fluid pump is operational. Lights: Check your brake lights, blinkers, headlights, and brights to make sure that they all work. Check all of the interior lights too. Power Components: If the vehicle has power windows or locks, give them a quick try. Also, your vehicle might have power seats and heated seats — be sure to check those too. If you don’t have power components, try out the locks, windows, door handles, and seat adjustments manually. AC & Heat: Flip on the AC, and make sure it cools. Also, make sure the engine doesn’t get too bogged down when you turn on the AC in your car. Be sure to check the heater too. Check the Gas Cap, Hood, & Trunk: Pull the levers for the gas cap, hood, and trunk to make sure that they release. While you’re in the trunk, make sure there’s an inflated spare tire (if that’s where it’s stored in your model), and make sure the spare kit is complete. If you can bring your vehicle to your mechanic for a second look, do it. While individual sellers may not let you take their vehicle to a mechanic, a lot of dealers will give you the go-ahead. If you’re here in Denver, and you’re looking at a German-made vehicle, feel free to bring it into our mechanic shop for a second opinion. Get in touch with us to schedule a minute to look at your vehicle.